Clean Agent Gas is simply put one of the best fire extinguishants known to man. The term “Clean Agent Gas” refers to Halon 1211 and 1301, HFC227 and FE36 among other gas formulations that are designed to deprive oxygen from a fire situation effectively taking away the ability of a fire to ignite & burn. This concept of fire suppression has been extremely effective for decades and is still the best way to stop fire in a closed environment and eliminating damage from the fire as well as from fighting the fire. Clean Agent Gas does not damage the fire area as “Dry Powder” extinguishers do. The saying goes, “whatever is hit with a dry powder extinguisher, whether it is burned or not will usually need to be replaced due to damage from the caustic, corrosive dry powder itself.” We understand that in the case of fire, the first consideration is and should always be to protect life and to try to put out the fire but you also must consider life after the fire. Clean Agent Gas is discharged as a liquid immediately converts to a gas with fast breakup into the atmosphere. 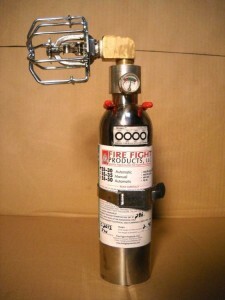 This makes it easy to direct and it reaches into hard to penetrate places where a fire or it’s ignition source may be. Clean Agent Gas is non-conductive of electricity and is effective on all three classes of fires, A, B and C.
Clean agent Gas of which Halon 1211 is critically regarded as the best example will not allow a fire to exist with only 5% by volume of Halon 1211 mixed in the air. Our product line incorporates many Clean Agent Gas designs both automatic passive and hand held deploy. We are also able to custom design a system for special applications if needed.